Finding a coin worth $300,000 in your change is no penny-ante proposition. If you come across a 1943 Lincoln head cent that is brown—and can confirm that it was mistakenly manufactured in bronze instead of zinc-coated steel—you might well be able to go to the cash window and celebrate. 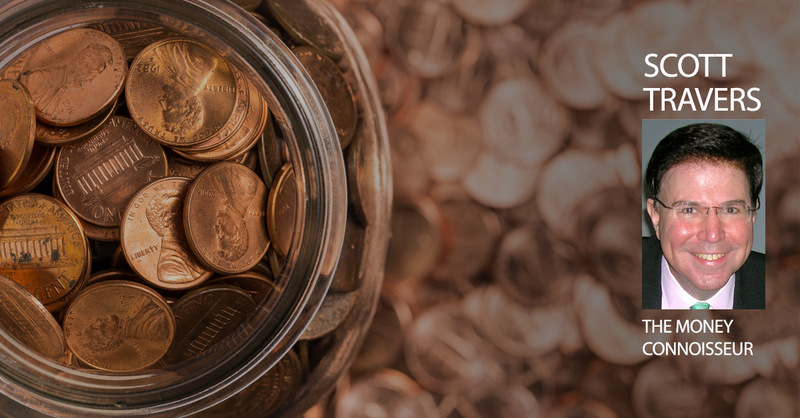 Lots of people who don’t collect coins have heard of the 1943 Lincoln cent made of bronze—that’s what happens when a coin that looks common is actually rare and valuable. Although this coin is frequently referred to in news articles as the 1943 “copper” penny, it is actually made of bronze, an alloy of copper, tin and zinc, the metal used to make nearly a billion pennies the previous year. The 1943 version is so valuable because no cents were supposed to be made of bronze that year—it was a mistake. The coin’s back (or “reverse”) bears two wheat stalks, the design used on Lincoln cents from 1909 through 1958. But it may not be too late for you! The tremendous publicity generated by the high value of these one-cent coins, combined with common-sense tips on how to tell if your coin is the real deal, have led to a number of recent discoveries of genuine and very valuable 1943 “copper pennies.” For example, in May 2017, the Numismatic Guaranty Corporation (NGC) confirmed the authenticity of two previously unknown 1943 bronze cents. Here’s how this historic mistake happened: In 1943, during World War II, certain metals, including copper, were needed for munitions. For the U.S. to maintain strategic reserves in copper, the U.S. Mint did not intend to manufacture any cents that year in bronze, which contains a lot of copper. Instead, more than a billion cents were manufactured in zinc-coated steel. These coins were silver in color when first manufactured and turned gray if they were heavily circulated—spent and passed from hand to hand. These common 1943 steel cents looked so much like silver coins that the public sometimes confused them with dimes. So the Mint discontinued manufacturing steel cents after 1943. For the last two years of the war, 1944 and 1945, and a year after that, 1946, the Mint made cents from brass, which it recycled from cartridge cases. In other words, pennies from that era are all supposed to look bronze or brown…except those made in 1943, which are all supposed to look silver or, if circulated, gray. Genuine 1943 Lincoln head cents that are bronze or brown in color are Mint errors. How did they happen? Apparently, a number of bronze coin blanks were left sitting in the hopper at the end of 1942, and these got mixed in with the zinc-plated steel blanks. Now, cue the counterfeiters. 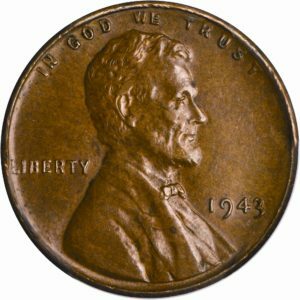 Because of their high value, 1943 “copper pennies” have been counterfeited by plating run-of-the-mill steel cents with bronze…and also by altering the dates of some non-1943 bronze cents. So, what should you do if you find a brownish 1943 cent in your pocket change or your old childhood coin collection? A basic way to determine whether your 1943 cent is made of steel and not bronze is to use a magnet. If your coin sticks to the magnet, it is steel, not bronze, and the magnet is probably worth more than the coin. If it is not attracted to the magnet, the coin might be composed of bronze, and its genuineness should be confirmed by an expert, as some 1945, 1948 and 1949 bronze cents have been altered, or retooled, to resemble 1943. The 1943 bronze cent pictured below— photo courtesy of the auctioneer—is lightly circulated (passed from hand to hand in commerce for a short time) and was sold at public auction by Stack’s Bowers Galleries in January 2013 to a collector for $317,250. Its authenticity was certified by the Professional Coin Grading Service (PCGS). In 2000, I made national news myself when it was widely reported that I sold a PCGS-certified Uncirculated or Mint State 1943 bronze cent to a collector for nearly $100,000. With a circulated example selling for more than $300,00 in 2013, that Uncirculated coin in 2018 is now worth nearly $400,000. 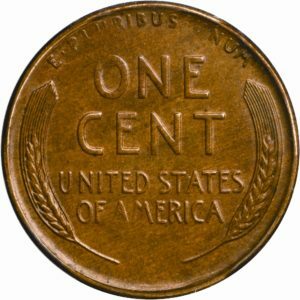 Of the three U.S. mints that manufactured cents in 1943, the bronze cent made in Philadelphia (with no letter appearing underneath the date) is the least rare, with possibly two or three dozen known. The 1943 bronze cent from the San Francisco Mint (with “S” under the date) exists in a quantity of perhaps 10 or fewer. Most rare is the 1943 bronze cent made by the Denver Mint (with “D” under the date)—only one is known to exist. In 2010, the unique Mint State 1943-D bronze cent reportedly sold for $1.7 million in a private transaction. And in 2012, the highest-graded 1943-S bronze cent reportedly traded for $1 million in what was also a private sale. In my price guide, The Insider’s Guide to U.S. Coin Values, 21st Edition, I value 1943 and 1943-S bronze cents that have circulated at $300,000. The two leading certification services that authenticate and grade 1943 “copper pennies” for a fee are the Professional Coin Grading Service (PCGS.com) and the Numismatic Guaranty Corporation (NGCcoin.com). If your lucky penny passes muster at either of these two grading services, I recommend consignment to a reputable firm for public auction as the best sale method.